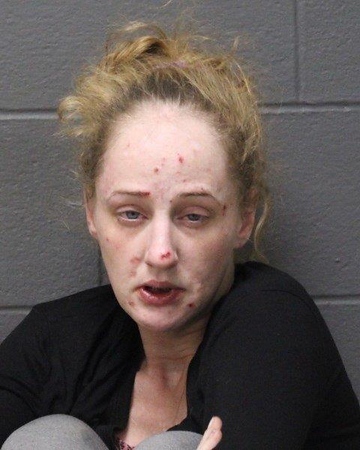 SOUTHINGTON - Southington police Wednesday arrested a New Britain woman who lied to officers about her name after finding her with drugs and discovering that she had a warrant out for her arrest. Amy Arnett, 31, was found passed out in a vehicle parked outside the Residence Inn, located at 778 West St., at about 9 a.m. Police had been called there on the report of someone passed out in a car. Inside the vehicle, police reported seeing wax paper folds, commonly used to package heroin, and brass wires, which are used to smoke crack cocaine. A search of the vehicle turned up suspected crack cocaine, heroin, marijuana, two Oxycodone Hydrochloride pills and a glass cylinder used to smoke crack cocaine. Officers asked Arnett for identification, but she said she did not have any and gave a name that wasn’t hers. Using Department of Motor Vehicle records, police were able to determine that was not Arnett’s real name. Police found that Arnett was wanted for first-degree failure to appear in connection with a case pending in New Britain Superior Court, where she faces charges of second-degree assault, carrying a dangerous weapon and second-degree breach of peace. Arnett also faces charges in connection with the incident Wednesday. She has been charged with criminal impersonation, use of drug paraphernalia, possession of a controlled substance and possession of prescription drugs. She was held on bond and was scheduled to be arraigned on Thursday in Bristol Superior Court. Posted in New Britain Herald, Southington Herald on Thursday, 24 January 2019 18:29. Updated: Friday, 25 January 2019 10:27.